Let your feral feline ways come to the forefront of your personality when you carry the splendid Badgley Mischka mini Cheetah print purse. 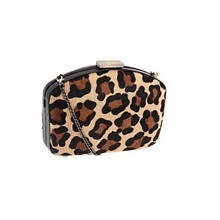 Carry this Cheetah stylish bag all around the city! Mini handbag made of genuine calf hair. Holds your wallet, keys, lipstick and a slim cell phone. Luscious interior lining with multifunctional slip pocket.